Sure, pudgy puppies are adorable. But if your small dog has bypassed pleasantly plump and become a candidate for the canine version of "The Biggest Loser," it's time to take action. 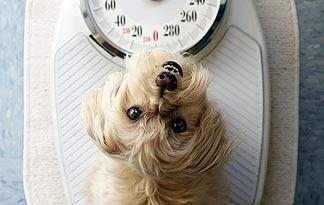 How can you tell if your dog is overweight? If you're unable to feel her ribs because of a thick layer of fat, it's a weighty sign -- for both of you. According to a 2009 study published in Public Health Nutrition, overweight dogs tend to have overweight owners. Lean dogs live longer and healthier lives, and are likely to be free of diabetes, joint stress and other maladies -- many of the same benefits that humans experience when they stay trim. Chart your dog's weight-loss course by first consulting her veterinarian, who can identify an ideal weight and uncover underlying health concerns. A simple blood test can reveal whether a metabolic problem, such as an under-functioning thyroid, is to blame. In many cases, your dog is probably just eating too many calories. Record your pet's weight to establish a baseline, then cut her daily food portions -- including treats -- by about one-third, advises the Shaker Veterinary Hospital in Latham, N.Y. Ask your veterinarian whether this reduction is right for your small dog. Make sure her food is nutritionally sound; the ingredients should be primarily meat, not legumes. Your veterinarian may suggest that you add vitamins or vegetables to your dog's diet, too. The vet may also have you gradually switch to a low-calorie dog food designed for weight loss. This way, your dog will be able to eat about the same amount she's accustomed to, but will still take in fewer calories. Table scraps aren't necessarily off-limits -- as long as they're healthy, too. The occasional raw carrot, piece of watermelon or ice cube serves as a treat without throwing your dog's diet off-kilter. You could also bake and serve the occasional organic, low-calorie treat. Just remember to include their consumption in your dog's daily calorie count and intersperse the treats with other affection, such as perky words and playful actions. If you take a daily walk or romp in the backyard with your small dog, this in itself acts as a reward. Don't be fooled into thinking free time in a fenced yard is all the exercise your dog needs. Your pet's unlikely to launch into a Jane Fonda-worthy workout without your encouragement. Keep in mind that your furry friend may tire quickly, especially if she's not accustomed to much more than lounging around the house. Signs of exertion include a slowed pace, panting and sitting or lying down -- don't push her after you see those signs. With deliberate eating habits and daily exercise, your small dog should start losing weight in about two weeks' time. The key, for canines or humans, is to boost nutrition, lower calories and increase movement. It's as simple -- and difficult -- as that. The good news is that by working together, you can both enjoy a healthier lifestyle.